red satin sash, seam pockets & skull cap. 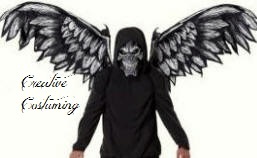 Matching skull cap also available separately. 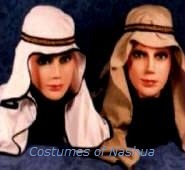 Matching skull cap available separately. Padre' is frequently used in the military. 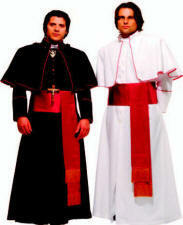 Includes: Black twill gown w/collar and sash. This hat is made of white velvet with a red velvet interior between the peaks & trimmed in gold lame. 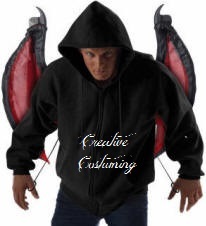 It is fully lined and has a secret pocket. w/gold metallic trim & gold stones. 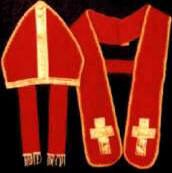 red sash/belt & skull cap. Includes: Red ponte' knit long sleeved gown accented with elbow length caplet, gold trim, matching waist sash/belt and skull cap. 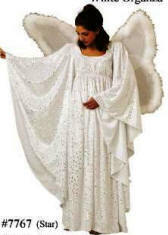 Includes: White satin/lace gown w/gold trim. 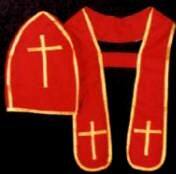 Long deep red robe w/gold edging. Quarter length overobe w/gold trim. Long collar w/gold cross on ends. 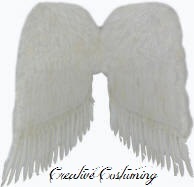 Rental fee for 10/15 - 11/15 add $35. Includes: Hat constructed with heavy pellon covered with red ponte knit and gold metallic trim. The set contains hat with matching collar. 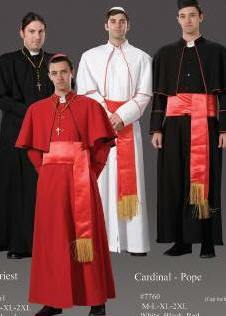 Includes: Heavy pellum covered with red ponte knit accented with gold trim, thin gold crosses and matching collar. 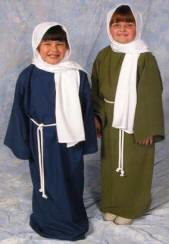 Includes: Heavy cotton blend robe with attached cowl hood & rope belt. The package says a rope belt is included but the manufacture has made a change so that it is not. 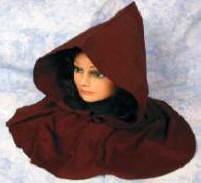 Includes: Cowl with attached hood. 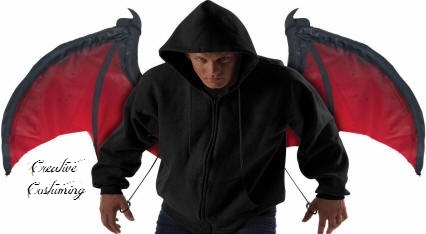 For the authentic look, the hood and has no opening in the cowl. Pull over head to put hood on. 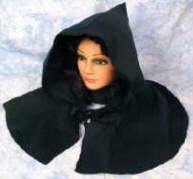 Includes: Cowl with attached hood. Front opening with tie closure. 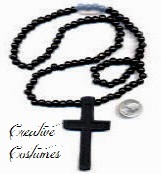 28" Black Beaded Wood Necklace w/Black Wood Painted Cross accented w/Inset Carving. 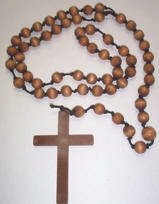 Beaded Wood Necklace with Wood Cross. 8" Choker, with 3" Extension (if needed). Includes: One Cross. 2" x 1.5"
Includes: One Cross. 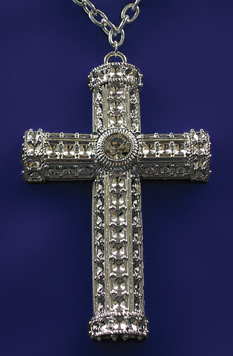 Height 4.5" X 3"
Includes: One Cross. 9" x 5.75"
Tranquil beauty at its best. 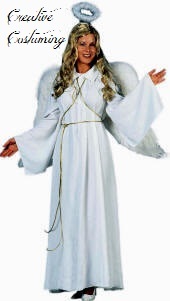 Includes: Angelic empire waist gown accented with wire hemmed flowing sleeves & skirt. Both bodice & skirt are lined. Same as above but in Panne Velvet vs Chiffon. 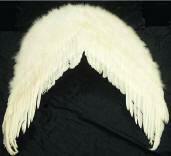 Size: Height 18-25"/Width (open) 21-26"
Size: Height 26-33"/Width (open) 26-30"
Size: Height 33-37"/Width (open) 30-34"
Feather Boa Angel Wings 19" x 17"
Includes: Movable Wings & Vampire mask. 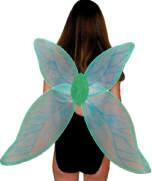 Wings slip on like a backpack & are operated by 2 side cords that can open the wings to up to 6' across. Child Size: 24" x 15"
Mother Abbess from The Sound of Music. 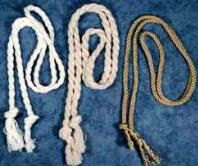 White Cotton Bib Collar & Rope Belt. 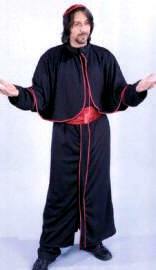 Includes: Robe, Headpiece & Cord Belt. putting on their collar & mantle. 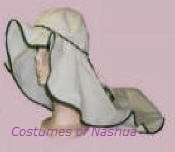 Includes: Black head piece with white band. Velcro closure on white band in back. 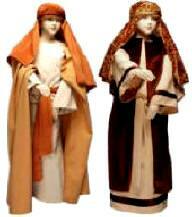 Includes: Desert sand colored undergown and head shawl with dark brown overrobe. The fabric is woven and dyed to create a weather-worn look. 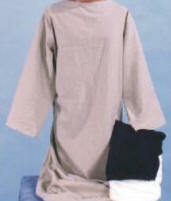 Includes: Heavy poly interlock white long sleeve undergown with a poly/cotton twill burgundy/brown overrobe and rope belt. 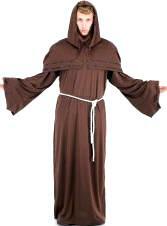 Includes: Brown gown/tunic with rope belt. 4 yard long plastic version MGB22 @ $9.99. 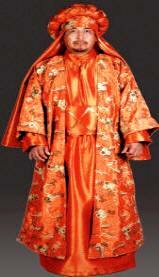 Includes: Poly cotton poplin coat and is made to be worn open. (no closures in the front). traveling Gypsy, colorful Storybook character. 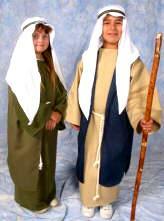 Includes: Beige long sleeve under gown w/matching mantle, multi color Caftan (overobe) of striped material with matching sash. Includes: White dress & a blue scarf shawl. 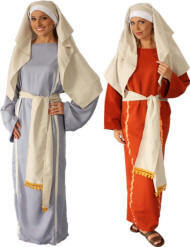 Includes: Long sleeved gown & caftan (overobe). Includes: Red ponte knit gown w/long sleeves. Gold overdrape & rope belting. 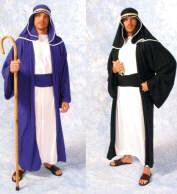 For your Biblical Easter Play. 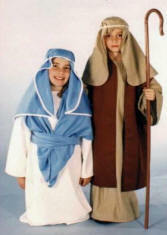 The Shepherdess is a versatile costume that can be used as a Shepherd, Biblical Townsperson, Mary (light blue) or Mary Magdalene (burnt orange). matching natural colored sash w/gold fringe accent. 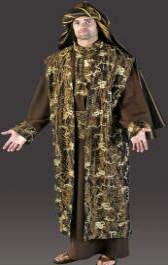 Includes: Earthtone textured gown w/gold trim & rope belt. Mantle with headband and rope belt. 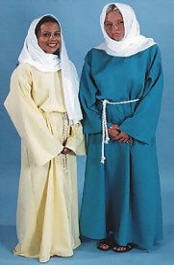 Includes: Floor length gown, over robe/tunic, matching belt sash & mantle. Includes: Gown and rope belt. The black & white are made of a heavy poly knit.  The natural fabric is made of a cotton sheeting. This gown is used w/many of our costumes. purple tunic with gold trim & a gold sash. 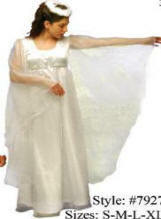 Includes: Floor length white poly knit gown with gold trim & velvet drape. White gown w/Purple drape, Blue gown w/Red drape. 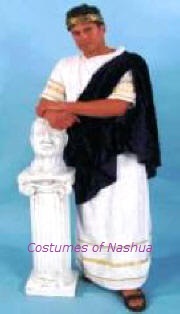 black ponte knit tunic w/ medallions, striped overvest, belt sash & high priest hat. Black and red ponte knit overrobe with metallic gold trim and detachable jewels (for easier cleaning). 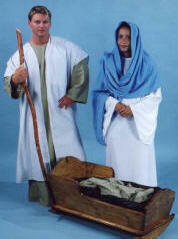 For your Easter & Christmas plays. 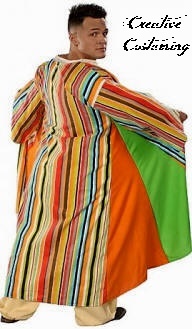 worship shawl, earth toned striped Caftan w/matching belt & hat. A Tallit is worn during weddings, burials, weekday morning prayers, Shabbat and hoidays. 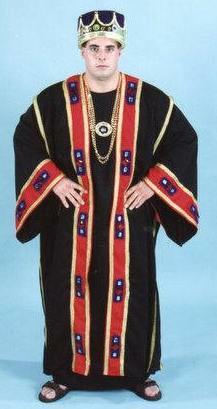 It is also worn for Selichos in Ashkenazic communities by the prayer leasder, even though it is still night. 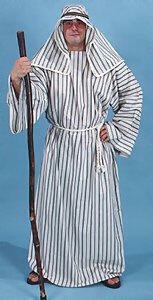 On Yom Kippur, it is worn at night. 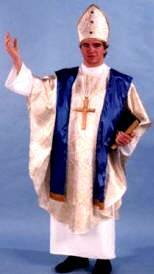 Includes: White poly gown, cream brocade overrobe w/gold & fur trim, belt & hat. Manufacturer says fits up to 50" chest. 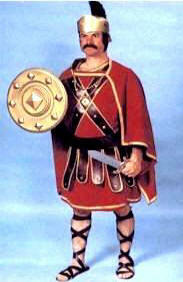 Includes: Burgundy/red tunic with gold metallic trim, matching red ponte knit cape with gold metallic trim and attached chain accent, brown vinyl armor with velcro side closure for easy size adjustment. All with gold metallic trim. 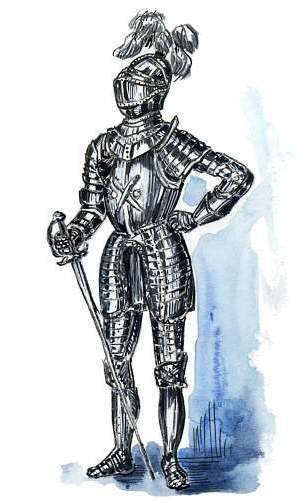 Helmet and Shield available separately. him by the Roman law. 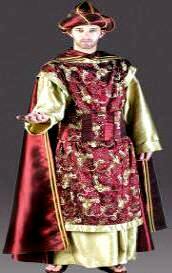 Includes: Full length red poly knit tunic with white & gold ribbon trim. Tunic length is approximately 58". w/white & gold ribbon trim. Tunic length is approximately 39". matching brocade belt & hat. Includes: Tunic, long vest, belt, headscarf. 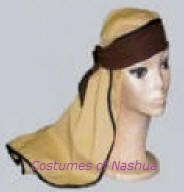 Includes: Tunic, overrobe, belt, headscarf. 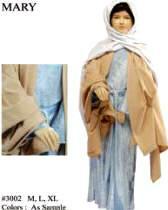 Includes: Gown, cape, belt & headscarf. Color: Various brown and tan colors. Includes: Long sleeved gown & rope belt. 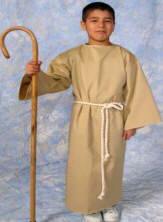 The shepherds crook has been assisting shepherds & herders for many years. Indispensable in removing a beast from pen or bog, it has become an icon of the shepherd. Beautiful walking stick with unique designs utilizing natural colors of wood & bark. 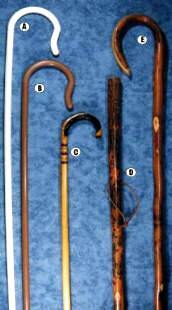 This staff is available in two lengths. shipping charges do not apply. Mantle can be ordered with assorted fabrics. wool on the inside when the weather was cool. 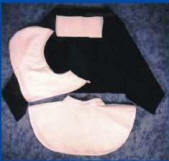 Includes: Heavy white ponte knit fabric decorated with black binding trim & a deluxe braided headband with back elastic adjustment. This is a version of the classic Shemagh that has been worn for centuries by desert people to protect them from blowing sand & glaring, burning sun light. Includes: Soft cotton blend 26" length (front to back) sewn with an elastic band around the inside to keep it from sliding off your head & edges sewn with binding so they don't fray. 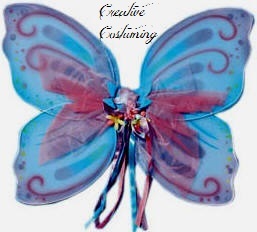 Comes with 45" colored band to tie around the back of the head, (over the headpiece). Tan w/Brown Trim, Tan w/Olive Trim. Includes: Soft cotton blend 36" length (front to back) sewn with an elastic band around the inside to keep it from sliding off your head & edges sewn with binding so they don't fray. Comes with 45" tie. Olive Stripes, White w/Black Trim. 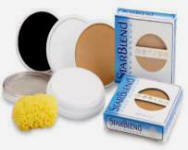 Star Blend is a water-activated pressed powder makeup & can be applied either dry w/a powder brush or wet w/a moist sea sponge. Set w/colorset powder & barrier spray. Cream Blend stick is a highly refined cream makeup containing vitamins, antioxidants, & silicones. Does not contain the petrolatum oil base in traditional "greasepaint" makeup. Allows for greater flexibility in blending & mixing of colors and stands up well under extreme lighting conditions. Includes: One Cross. Height 3"